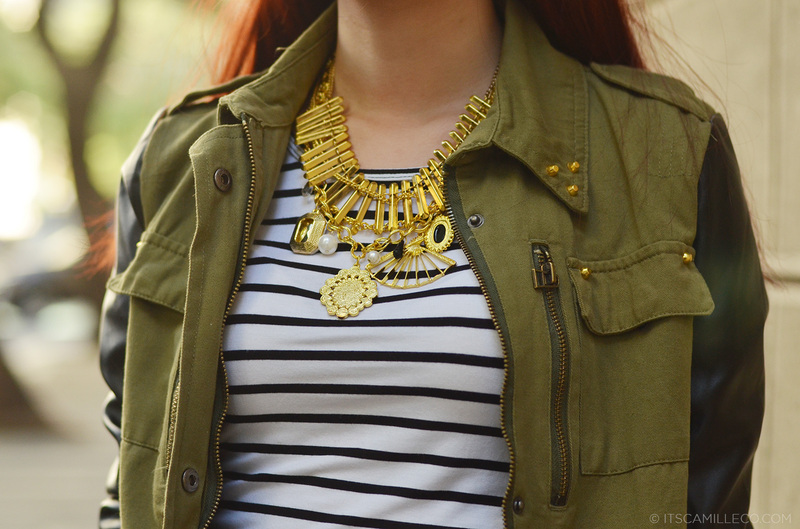 How about something military chic for today’s post? I got inspired by my new military jacket from She Inside. Instead of pairing it with the usual edgy pair of shorts or pants, I tried mixing it up a bit with my ruffled skirt. Now, my outfit is both masculine and feminine which makes for an interesting combination. If you’re wondering why the title, take a look at the clutch I’m holding. Would you believe that’s a hat? It’s a bag AND hat in one! Coolio! Tada! My black and brown clutch is now a black hat AND a brown clutch! Nifty, right? Let’s say I was strolling down a park and the sun was hurting my head. Wait a minute, no big deal. Let me separate my hat from my clutch. LOL! So handy! This is how they separate. They have these little buttons that attach them together. With the hat on, your outfit made you look like a cute lady leprechaun! Hi really like this bag. 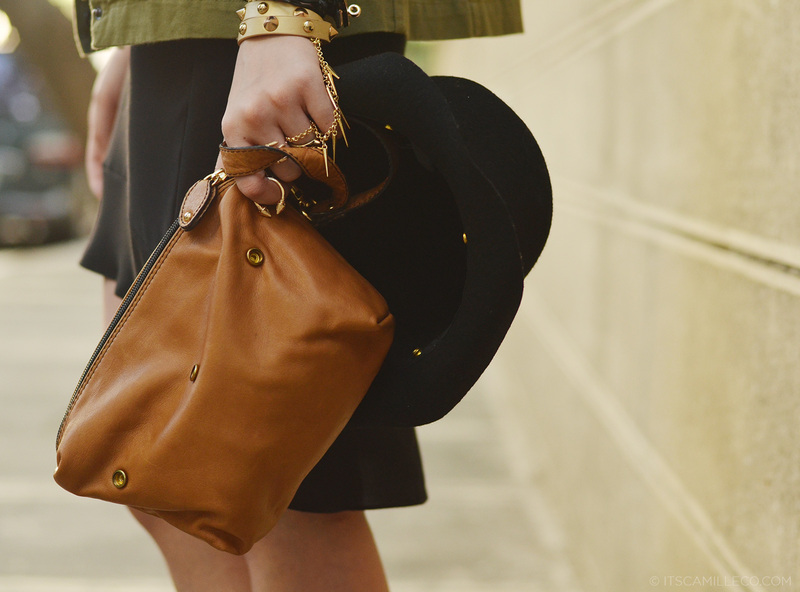 The hat bag is a very and magic idea. I see the website Les Envers..cool!! One of my favorite post of yours. The jacket and shoes are quite a steal. Clap! Clap! Hello! :) It’ll be my 13th birthday on March 1 (hope you could greet me through Twitter :”>) and I’ll be celebrating my birthday sa Enchanted Kingdom with my friends, can you suggest something to wear that will be comfy yet fashionable (I prefer wearing jeans on that day)? :) THANKS! :) Stay pretty and fashionable. Shucks sige let’s see :) Thanks Dellybee! 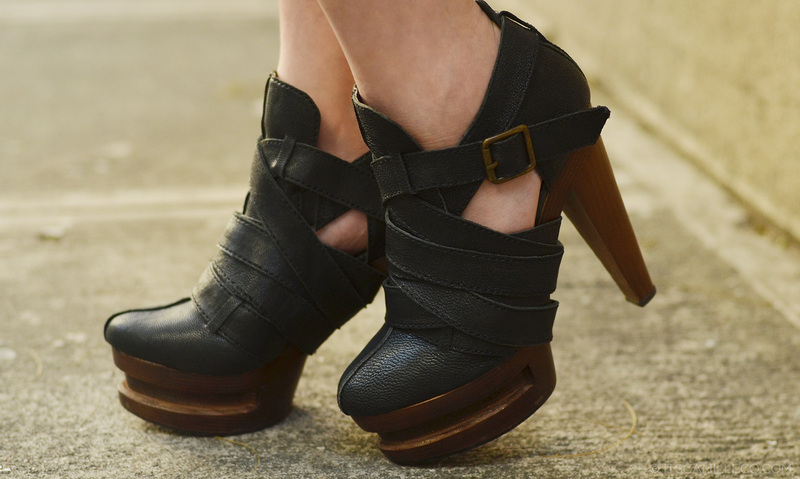 Are those wooden soles? Giving a whole new meaning to the term clubbing with heels. Haha I find the bag so interesting and very funny at the same time! I mean, who would’ve thought, right? Brilliant idea! The designer deserves a slow clap and 3 snaps. Slow clap and 3 snaps! :) Hello there bangs! Wow, I love this look….especially the bag and hat in one, how convenient! Right? It really is! Haha! Bag in a Hat! Ang cool! perfect sa napapalapit na summer :) Ang galing Ms. Camile! Nice shoes and bag Ms. Camille :) Love it! Love the backstory! Haha! :) Thanks Grandyy! Amazing Les Envers hat bag! It was so cool and very cute, 2 in 1 ang peg ^-^ Perfect combination! Love this edgy side of you Cams! I love that 2 in 1 hat/bag … it’s such an innovative and quirky design. It is innovative and quirky :) Thanks Sharon! She Inside still has it! :) Thanks Isa! Oh I just love your shoes! They have so much attitude so to speak. Btw cams, can u help me out? I wanna know the right pronunciation of the make up brand etude house. How do u say etude? Pleeeease, I just need to know so that I won’t be a shame. Thanks! Luv yah! OMG, that hat/bag thing is so CUTE! So creative! you’re always versatile camille…continue to inspire us with your post! 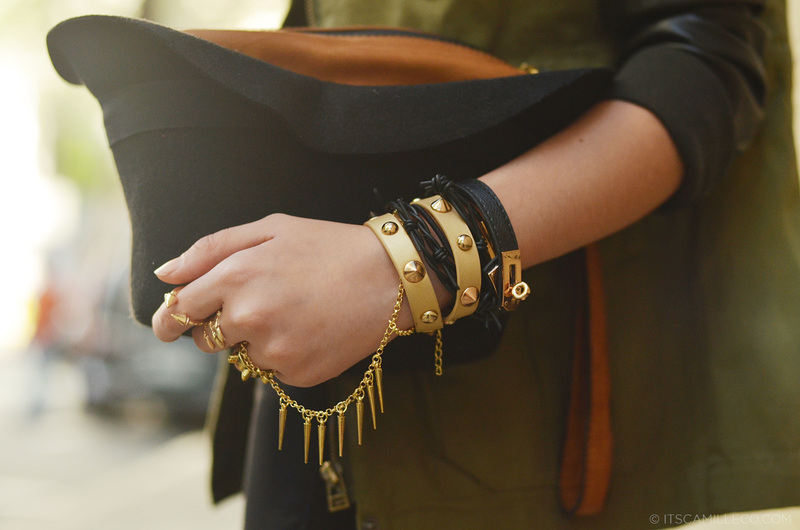 I love Military Chic Fashion! Reminds me a lot of Victoria Beckham! I wonder lang, bakit di ka sumasali sa PFW? Naalala ko kasi bigla yung latest collection ni Posh eh. That Bag + Hat looks so cool! Parang magician lang. “I’mma pull a bag out of this hat. Don’t believe me? I’ll show you!” Super nakakaaliw! Haha! cool hat bag! :) HYPED! This outfit is awesome!!! it’s really suit ti your hair. Love it!